PPC, also commonly known as pay-per-click, is a method of search engine advertising to generate clicks to your website. Unlike organic search, PPC involves paid search marketing. Paid search marketing means you pay for your website to appear in paid advertising sections of relevant search engine results pages. In simpler terms, results are determined by payment from advertisers. Organic search is based on natural, unpaid rankings. These rankings are determined by SEO best practices, including well written optimized content, creating accessible and relevant URLs and keywords, producing captivating title and description tags, and off page optimization strategies. These efforts can be performed in-house or by outsourcing SEO campaigns to an experienced agency. Other popular SEO practices are updating and posting new blogs, finding and removing broken links, looking at competitors’ keywords, and using outreach and marketing tools to make the company more known. Paid search allows you to pay to have your website displayed on the search engine results page when someone types in specific keywords and/or phrases that match the demographic and other targeting setup within the 3rd party search providers system. There is budget setup as well as detailed targeting criteria that determines where and how your ads are shown. The paid search providers have a campaign setup and maintenance process involving keywords, negative keywords, demographics, geo-graphics, campaign performance metrics, landing page optimization, as well as bidding strategies. Search ads, like mentioned above, means a business advertises within the sponsored listings of a search engine or a partner site by paying each time your ad is clicked (PPC). For example, a consumer who wants to look for new iPhone headphones will head to Google and search for a keyword or topic related to headphones for a smartphone. When an ad is shown, he or she will click the ad and be taken to a landing page having content related to the search, and hopefully, purchase the product. Display ads are shown to consumers when they are browsing online. Based on the targeting being used, this happen when searching for your product or service, or when they are reading online where the content is related to their search. The ad can be triggered by their intent, or because of the relevant web property or placement they are on. These ads are advertised through banners or other ad formats made of text, images, audio, video, etc. These formats can include various placements including the top of web pages (similar to the traditional banner ads) and larger text, such as billboards. For example, a consumer is searching the web for study materials for his/her upcoming exam. Various musical artists are shown with new releases. The consumer isn’t specifically looking for new music, but display and banner ads are showing up throughout Google. He or she then clicks on the image with the promotion taking them to the corresponding landing page. Remarketing ads are strategically placed ads to connect with people who previously interacted with your website. If a customer leaves your site without buying, remarketing allows you to market to them again. For example, a consumer has recently browsed Best Buy and had added items in his or her online shopping cart. He or she decided to leave the site before purchasing a product. A week later, that same consumer went back online and your ads are show again or remarketed to the consumer. Based on the web property, the same items recently added to her Best Buy shopping cart can appear, alongside other similar products that he or she may think of purchasing. You should always define your goals and objectives (both short and long-term). This includes identifying and maintaining your specific audience. This should include repeat customers but also new customers. Determine which type of campaign(s) best fit with your goals and audience. Companies often use both organic and paid search programs. Search-based campaigns can be a better fit for some, while sales-based campaigns can be better for others. You want to increase sales and revenue. You want to increase site visitors. Do what your competitors are doing. Do what your competitors are not doing. Optimize content to maximize shareability. Improve company outreach and recognition. Writing good ad copy for PPC ads can be tough, but if done well, can make your company more profitable. Similar to any approach, you should define and thoroughly know your target audience and what they want. A crucial way to gain the attention of potential customers is to ensure that you know how to, and more importantly, can fix their issues and pain points. To help you better figure out what your audience wants, look at it from the customer’s perspective and decide what you personally would want from the specific company. Then, determine how you as a customer would fix the problem, and implement this into your actual practice. Next, you should always address the audience in your ads. Using the words “you” and “your” are extremely important. If the audience believes that you are talking directly to them, they will more likely have a positive attitude towards your business. Make sure to utilize human emotion. A potential or existing customer does not want to read a boring ad that he or she cannot relate to. You want to make your audience feel something. To do this, determine what emotion(s) you want to captivate and tap into. Sometimes evoking negative feelings can be better than positive feeling because people tend to act quicker when they see or hear something bad happening and want to solve a problem. For example, if you are doing an ad on childrens floats for the pool, mentioning the high risks of adolescent drowning would be more beneficial than targeting solely the floats. If a parent reads an ad that says, “Drowning is the 3rd leading cause of unintentional injury death worldwide”, they would probably be keener to act. Using metrics and numbers is very important. Spelling out each number is not only time consuming, but less appealing to the eye. Be sure to use exact numbers instead of rounding. Numbers and statistics tend to grab people’s attention, so utilize this as much as possible. It’s also crucial to use all the space that is provided. Google AdWords allows up to three 30-character headlines and up to two 90-character descriptions. Make sure to fit all the necessary information into this space, while also using a display URL and ad extensions if desired. 1. What does my company/business do better than anyone else? 2. Are you making any special offers or doing anything that sets you apart? 3. What is unique about your brand image? 4. What customer problem are you solving? When thinking about ads, you should also strive to go local. People tend to trust businesses that are small and local, rather than huge corporations. If you have a specific geo location but want to expand into other areas, make sure to create different campaigns for each location. Use keywords that match those geographic locations. For example, if your campaign is taking place alongside a coastal area, it is smart to include terms such as “beach”, “rock”, “sea”, “water”, “offshore”, etc. Start your campaigns with strong, action verbs that grab the reader’s attention. If you start off your ad with the words “Call for more information”, readers are going to skip right over that. However, if you start your ad off with something like “Get a huge discount” or “Save up to 10%…”, readers will be more inclined to click on your ad. You should regularly review and maintain your PPC ads. One way to do this is to split test between your ads to see what is working and what needs to be improved upon. There are numerous methods to split ads, but some of the more common include: placing your ad in different locations, using different words in your ads, trying different figures and statistics, experimenting with different display URLs, and emphasizing various advantages of your service. There are several 3rd party tools to help you create, maintain and improve your PPC campaign performance. They are also a great way to review your campaigns and metrics against your competitors. Reviewing competitor search ads over different days and hours of the day will give you a barometer on the market and competition. Lastly, creating a successful PPC ad takes time. However, it will get easier with time and practice. Determining your goals and objectives, defining your budget, targeting your niche audience, making a list of relevant keywords, bidding on the right keywords, creating an attention-grabbing headline and description, and utilizing human emotion are just some ways to produce the compelling ad you need. When it comes to developing a winning social media strategy, Google says quality content is key in terms of earning a higher ranking on their results pages. Since 2011, Google’s most popular ranking algorithms—panda, penguin, and hummingbird, respectively—have been focused on indexing and ranking as much quality content existing on the Internet as possible. Intuitively this makes sense, but it also begs the questions: what exactly is high quality content and how does Google define and/or recognize it? In order to answer these questions, you first have to understand Google’s ultimate aim for their search engine; how it is evolving; and what steps you can take in order to generate content that is consistently well-written, well-researched, and relevant. Accounting for 3.5 searches daily, and approximately 1.2 trillion searches per year, Google has surpassed all platforms to become the leading online search engine. Every day, consumers rely on Google to generate the most relevant and reliable results concordant with their specific searches. While there are multiple search engines competing for our attention, Google sends the most traffic to your site, and thus, remains the most popular. Despite its market dominance, Google must work to maintain its competitive edge over other popular search engines like Bing and Yahoo. Over the past several years, Google has rolled out a series of policy changes and algorithm updates aimed at ranking quality sites higher in search results and demoting and removing lower quality sites. With each new and improved iteration, Google strives to create a more seamless connection between users and the knowledge they seek. As technology continues to evolve, so too, will Google’s search features. Google wants to be the default search engine; the one that instinctively understands user’s intentions when they ask a question and then immediately provides them with the exact information they want and need. With each new algorithm, Google is making it clear that the focus should be on publishing quality content that is the best of its kind rather than ranking for keywords. While keywords can provide useful context to your digital content, they have become a bit of a hindrance when it comes to conducting online searches. Without the proper context, the intent and use of your selected keywords may confuse/mislead users, or even direct them to a different website altogether, thereby returning the exact opposite results you want. Google has decided that keyword-heavy, low-quality content is out; high-quality content is in. Webmasters, content developers, and business owners alike have little choice but to shed their allegiances to traditional SEO tactics and follow Google’s lead. How Does Google Define Quality Content? 1. Learn your audience and engage your core clientele. A successful social media strategy begins and ends with consumers, so it is imperative to understand who your target demographic is and how to appeal to them. In other words, create content that establishes trust and credibility among your users. 2. Provide valuable information that users are looking for and will actually benefit from. Be transparent and don’t confuse or mislead users with deceptive titles merely to improve your ranking. Whatever you write about should be informative, interesting, and meaningful. 3. Become a resource. Link to high quality content from other sources and refer to them from your own page to increase the legitimacy of your site. 4. Publish new and innovative content as often as possible. For Google, what you publish is more important than how often you publish, but you should strive to be consistent as possible when it comes to producing fresh content. 5. Differentiate your website as much as possible (especially from those with very similar objectives). Think about what makes your website unique, and create content that emphasizes your individuality. 6. Establish a call to action that allows you to connect and interact with your customers and vice versa. Encourage them to ask questions, leave comments, and share your post — anything to stimulate interest and keep consumers active and engaged. As quality content becomes an increasingly crucial tool for business growth and development, it is necessary not only to have a refined strategy that encompasses the preceding points, but to frequently assess whether your content is helping you meet your short and long-term business goals. Creating quality content that is easy to read and navigate should be your primary goal, and Perfexion, Inc. is here to help! Our qualified professionals specialize in producing high quality content on a consistent basis that can increase your ranking and reputation, while also keeping you in Google’s good graces. In the age of the Internet, site speed is paramount. Smartphones and tablets, in particular, have revolutionized the way consumers search and shop for their goods and services. These days, consumers anywhere can, with a few quick keystrokes, connect with businesses both at home and abroad in a matter of seconds. Especially now that mobile search traffic has outpaced desktop search traffic, Google and other popular search engines expect all websites to load quickly on mobile devices of any kind. The bottom line, according to webmasters and SEO experts, is that optimizing for speed will enhance SEO and improve rank and visibility on results pages. Accounting for 3.5 billion searches daily, and approximately 1.2 trillion searches per year, Google has surpassed all platforms to become the leading online search engine. Every day, consumers rely on Google to answer questions, provide directions, and generate the most relevant and reliable results concordant with their searches. To maintain its competitive edge, Google has been rolling out a series of policy changes and updates over the past several years that reflect the shift from desktops to mobile devices. In 2015, Google confirmed that mobile searches surpassed desktop searches for the first time, and as a response to this surge of mobile users, Google developed a “mobile-first” algorithm as a way to compel content developers to design their mobile sites first, prior to designing their desktop sites. More recently, in June 2018, Google announced that site speed will be the primary ranking factor for mobile searches as well. Although site speed has been used as a ranking signal previously, it was focused exclusively on desktop searches. Google’s aptly named “Speed Update,” will prioritize page speed by down-ranking websites that deliver slow, low-quality loading experiences to users. Yet even with 250 ranking factors in play, webmasters agree that site speed and site design are two of the most important ranking factors Google takes into consideration, as they have the biggest impact on user experience. So let’s explore why site speed, specifically, is so important in more detail. In today’s ever-changing and fast-paced world, speed is key. As consumers, we want everything—including food, information, money, and news—readily available to us with minimal wait time. This need for speed is most evident online, however, where consumers have even shorter attention spans and higher expectations than they do in the real world. Regardless of whether they are using a desktop or a mobile device, consumers expect the websites they visit to load quickly, without any issues or delays. Recent surveys conducted by Google indicate that users expect websites to load within three to four seconds. Moreover, statistics show that 40% of users will likely abandon a website and attempt another search if the initial webpage doesn’t load within three seconds or less. ** These statistics may seem unrealistic, but they underscore the fundamental truth that a fast site helps you rank higher among the competition. The issue of site speed is most pronounced on mobile devices, where the average mobile webpage takes approximately fifteen seconds to load. For e-commerce businesses especially, time is truly of the essence when a faster website offering identical goods and services is only a click away. The goal for web developers, then, is not only to create a fast loading site, but to create the fastest mobile site possible. In so doing, web developers will simultaneously decrease their bounce rate, increase their conversion rate, and establish trust and brand loyalty with their client base. Still, optimizing for speed is about more than enhancing SEO and improving rank and visibility on results pages. Loading speed is the first experience users have with a site; so if the site loads slowly, that first impression will likely be a negative one. Poor page performance and slow loading speed signals, at worst, a lack of respect for your customers and their time. In sum, prioritizing site speed is the single most important factor when it comes to improving user experience. Sites that load quickly make for an enjoyable browsing experience, which means customers will feel compelled to browse more, buy more, and even tell others about your website. Additionally, adopting the “Speed Update” will keep you in Google’s good graces — and rankings! Users who frequent your site are satisfied not only with the individual site experience, but also with the quality of results that Google provides. When analyzing the SEO of websites, site speed is one of the first metrics to be measured. 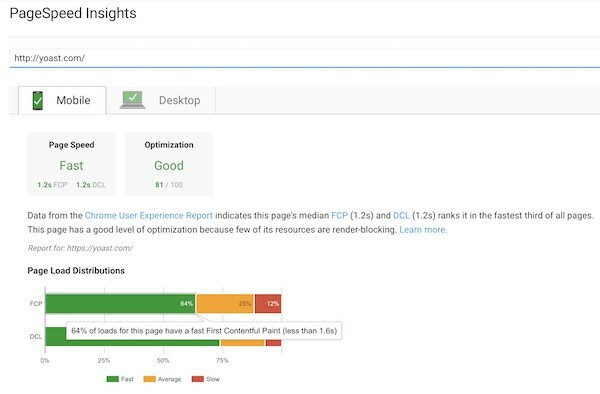 Free resources like Chrome User Experience Report, GTMetrix, Lighthouse, and PageSpeed Insights can offer a more comprehensive picture of such metrics. These resources provide valuable insights into site performance including: advertising impressions, affiliate clicks, engagement rates, and conversion and revenue rates. Additionally, these metrics allow you to see how well your site is reaching your target demographic, as well as how users interact with your site on both desktop and mobile devices. It is important to note that these speed tools do not always yield consistent results due to changes in location and internet access. When taken together, however, they offer a broad overview of who your users are, how they access your site, and what they do during their visit. They also measure page speed and optimization, and make suggestions about how performance can be improved. For best results, you would do well to hire a professional marketing company with the expertise to develop websites that optimize for page speed on both mobile devices and desktops. If you need assistance making your website fast, responsive, and mobile-ready, Perfexion, Inc. is here to help! Our qualified professionals specialize in managing and maximizing clients’ web content, ranking, and search results traffic. For webmasters, content developers, and business owners alike, search engine optimization, or SEO, is an essential part of driving search traffic to your website. There are several ways to enhance SEO and improve rank and visibility on results pages, but switching your website from “HTTP” to “HTTPS” is an important, effective, and recommended strategy for increased optimization results, as well as increased privacy and security. HTTP versus HTTPS: What’s the Difference? You probably recognize the familiar acronym “HTTP” that magically and mysteriously appears in your address bar every time you visit a website, but do you happen to know what it stands for or what purpose it serves? Moreover, are you aware of why the shift to “HTTPS” has gained so much traction and attention over the past four years? In 2014, Google officially announced that switching your website from HTTP to HTTPS will give you a minor ranking boost, but is that the only benefit? Let’s explore the evolution of HTTP to HTTPS, including the pros and cons associated with each, in more detail. HyperText Transfer Protocol, or HTTP, is the means by which information is sent and received across the Internet. In technical terms, HTTP is an “application layer protocol,” which means that the data being communicated between the browser and the website is sent over in plain text. Although HTTP is said to be stateless, meaning that no attempt is made to remember specific information that is entered, the lack of a secure connection increases the likelihood that your data may be intercepted and exposed. This is especially concerning for those of us who use the Internet to pay bills or make purchases — two common activities that require our most sensitive information! To prevent massive security breaches of personal information, HyperText Transfer Protocol Secure, or HTTPS, was developed to ensure that all information we view or send is secure. The chief difference between HTTP and HTTPS is that instead of acting as its own application layer protocol, HTTPS works in conjunction with two separate protocols — SSL (Secure Sockets Layer) and TLS (Transport Layer Security) — for added privacy and security. Neither HTTP nor HTTPS are particularly concerned with how information gets from one point to another; so the SSL has the incredibly important task of ensuring that all information travels through a secure ‘tunnel’ to its ultimate destination. Without getting overly technical, the SSL also encrypts the information that is being sent, which means that the true meaning of your most sensitive data (bank statements, credit card numbers, and login information) is disguised, making it more difficult for a third party intruder to access or decipher. As you might expect, HTTPS has faster speeds and connections than HTTP. This is because encrypted websites supporting HTTPS have already been certified as secure, whereas unencrypted websites supporting HTTP need to be filtered and scanned before connections can be established and user access can be granted*. Most popular browsing platforms—Internet Explorer, Firefox, and Google Chrome—support HTTPS for more secure and streamlined Internet browsing. Switching to HTTPS can improve SEO and the rank and visibility of your website on results pages. In 2014, Google confirmed a rankings boost for websites supporting HTTPS. Although the exact percentage is hard to quantify, the value of switching has increased significantly over the past four years. More accurate referrer data is another benefit of switching from HTTP to HTTPS. When traffic comes through HTTP websites, for example, it shows as “direct” traffic in the analytics report even though no information has been saved. Conversely, when traffic comes through HTTPS websites, referral traffic data is preserved. As a result, you can determine precisely where your search traffic is coming from**. Websites supporting HTTPS provide enhanced privacy and security. First, by verifying that your website is the one the server is supposed to connect to, and second, by encrypting all communication (including URLs) which protects browser history, credit card numbers, and passwords. In June 2014, Google launched its “HTTPS Everywhere” Campaign in an attempt to create a more secure internet. Two months later, in August 2014, Google announced that switching websites from HTTP to HTTPS may give webmasters a minor rankings boost, as an added incentive to switch. Since then, Google has taken additional—some might argue even controversial—steps to compel more webmasters to upgrade to HTTPS. One way Google is taking control of the HTTPS movement is by marking websites that do not support HTTPS with a bright red “X” over the padlock icon in the URL bar. The purpose of the red “X” is to classify HTTP supporting websites as unencrypted, and therefore, unsafe. Last year, in January 2017, Google took their campaign one step further, and began showing “NOT SECURE” warnings on HTTP pages featuring credit card and password fields. Presently, even more serious changes are on the horizon for users of Google Chrome, and they will be rolled out in two stages. In the first stage, which is set to begin September 2018, Google Chrome will no longer display a green “warning” icon in the URL bar for secure websites. In the second stage, beginning October 2018, Google Chrome will display a prominent red warning on all HTTP supporting websites indicating that those sites are “Not Secure.” This new interface serves as an aggressive reminder that all HTTP websites are insecure, and that HTTPS will officially be the default state of safe websites. For those of you who have been on the fence about switching from HTTP to HTTPS, the time has come to make a decision. Not only will upgrading to HTTPS keep you in Google’s good graces, but it will also protect your website against third party hackers trying to intercept sensitive information. According to web experts***, more than 50 percent of internet browsers worldwide use Google Chrome, so these changes will impact users across the globe. Even if your HTTP website is safe, the blanket warning issued by Chrome may scare off potential visitors, prompting them to leave your site. In short, failure to upgrade to HTTPS may negatively affect advertising impressions, affiliate clicks, site traffic, and overall revenue. Heightened privacy and security for your site, increased optimization, and a safer Internet for all users are just a few of the reasons why switching from HTTP to HTTPS is beneficial. If you want to learn more about HTTPS, or need assistance changing your entire website from HTTP to HTTPS, Perfexion, Inc. is here to help. We specialize in managing and maximizing our clients’ web content, ranking, and search results traffic. Contact us to learn how we can make your website more secure and keep your SEO efforts and strategy strong. Over the past decade, smartphones, tablets, and PCs have facilitated a vast and virtually ubiquitous online presence. Smartphones and tablets, in particular, have revolutionized the way consumers seek, search, and shop for their goods and services. These days, consumers anywhere can, with a few quick keystrokes, connect with local businesses at any point, and from any channel, in a matter of seconds. While mobile SEO, searches and design have gained significant traction over the last couple of years, accounting for over half of all online traffic, the prevalence of desktop searches should not be overlooked or underestimated. Mobile versus Desktop: How Do They Differ? You might be surprised to learn that, despite the ongoing debate about which device is preferable, SEO for mobile and desktop adhere to the same basic principles and best practices. That said, there are some key differences that must be acknowledged and implemented into your overall strategy for each platform. Let’s begin by exploring why mobile and desktop have different rankings, how to compare them, and what these differences mean for your long-term SEO goals. 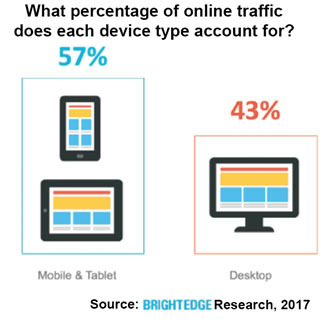 According to recent statistics gathered by web experts at BrightEdge, 79 percent of listings have a different rank on mobile devices compared with PCs or desktops. Furthermore, they found that the top-ranking result for a given query is different on desktop and mobile 35 percent of the time. * So, what do these statistics really suggest? First, that mobile and desktop searches use vastly different algorithms to determine SERP listing data, and second, that any successful Search Engine Optimization strategy requires a highly developed understanding of user intent. Most popular browsing platforms—Internet Explorer, Firefox, and Google Chrome—are working to provide the best user experience for searchers, regardless of what device they are using to conduct the search. In order to do this, however, they need to establish some degree of user intent; in short, they need to anticipate the needs of the users and meet them accordingly. Although user intent differs per person (and device) the general consensus is that the intent of mobile users is more immediate and transactional, whereas the intent of desktop users is more generic and informational. Based on the preceding generalizations, we can further surmise that users conducting searches on their mobile devices are more likely to seek and yield localized results, whereas users searching for products or services on a desktop are more likely to browse generally on various ecommerce sites. Search Engine Optimization, SEO, is also inextricably linked to the conversions likely to occur on each device. Those of us with smartphones, for example, know firsthand how convenient the click-to-call feature is, which is what most users use. Conversely, desktop users are more inclined to send emails or submit contact forms regarding their specific inquiry. Micro-moments are particularly telling for mobile users, who are generally in need of immediate results. As an example, a mobile user searching for “fresh produce” is likely looking to buy fresh produce right away, so SERP may return a local map showing grocery stores or farm stands nearby. Alternatively, on a desktop, a user searching for “fresh produce” is more likely conducting a general search. The user could be looking to order fresh produce online, but they could also digress to researching the health benefits of fresh produce, searching for recipes, or looking at other pertinent content. In sum, these micro-moments impact how SERP is constructed, and determine the relevancy of the content that appears. Site developers, marketers, and webmasters need to recognize how mobile users interact in these micro-moments—as well as how intent differs between mobile devices and desktop—if they want to ensure that the generated content corresponds to both device and user intent. What Does the Future Hold for Online Searches? In 2018, mobile searches are continuing to outpace desktop searches, and this upward trend is projected to continue well into the future. As a response to this surge of mobile users, Google is developing a “mobile-first” algorithm as a way to compel webmasters to design their mobile sites first, prior to designing their desktop sites. The popularity of mobile searches, however, does not diminish or negate the importance or prevalence of desktops, which account for 43 percent of all online traffic. Similar to mobile devices, desktops generate their own SERPs. Furthermore, descriptive keywords and longer articles are better suited, at least presently, for desktops and PCs. Whatever the future holds for online searches, it is essential to have separate SEO strategies for both platforms and to track and monitor their performances regularly. Free resources like Google Analytics, for example, provide a fuller picture of such metrics — including advertising impressions, affiliate clicks, engagement rates, conversions and revenue rates, and even what percent of search traffic comes from mobile devices and desktop, respectively. These metrics will allow you to see how well you are reaching your target demographic, and also how users interact with your site on both platforms. For best results, you would do well to hire a professional marketing company with the expertise to develop content that is compatible on both mobile devices and desktops. If you need assistance making your website responsive and mobile-ready, Perfexion, Inc. is here to help. Our qualified professionals specialize in managing and maximizing clients’ web content, ranking, and search results traffic. Website security has been garnering a lot of attention lately. More and more website owners and web developers are paying attention to the topic of security and to the very real potential that their website can get hacked. A website that is not well protected or properly optimized for search engine optimization (SEO) is at greater risk of being hacked than one that is. Your SEO results and search engine ranking can take a hit if the security of your website has been threatened. What are the chances of your website getting hacked? What are the most usual types of website compromises? What steps can be taken to avoid getting hacked and subsequently penalized by Google with a lower search result ranking? When you understand the answers to these questions, you’ll know what steps to take to prevent future hacks and thus ensure your SEO strategy will remain sound. In March 2017, Google presented information on the state of website security*. Most alarming is their statistic of a 32% increase from 2015 to 2016 of the number of websites that had been hacked. Even more alarming is that Google expects that number to rise as a result of websites becoming more and more outdated and hackers becoming more and more sophisticated and aggressive. What Are the Most Common Ways a Website Can Be Hacked? Spam – Hackers upload seemingly safe and innocent content and images on legitimate websites with the purpose of redirecting users to malicious websites. Links within the content, or even clicking on or opening a document, can cause damage to your own website. Malware – Malware is any type of software that harms people’s data and devices. Because malware can affect your users directly, it is critical to heed all warnings against it. Credit Card Fraud – Of particular concern to e-commerce websites, hackers skim credit card information and steal users’ data. This type of compromise not only hurts your users, it is a sure sign that your website is not secure – and ultimately damages your reputation. If your site has been hacked, finding a solution to the problem can be difficult because botmasters and hackers do their best to always stay a step ahead. When you make the security of your website a top priority, you reduce the potential of hackers, malware, and bots getting in and taking over your website and the data it contains. You can, however, take steps to make sure your website is as secure as it can be. Get critical notices – Once you have added your website to Google’s Search Console and verified that you own it, you will receive important notifications from Google regarding security concerns, such as hacking events, that you will want to address promptly. 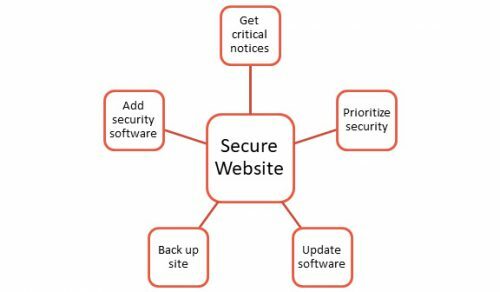 Prioritize the security of your website – Security should be your highest priority for your website – make sure everyone who contributes to your website operations understands how critically important security is. Update software – Keep all software and plug-ins updated to the latest versions and releases to minimize hacks. Back up your website – Regular back-ups of your website are critical. In the event you are hacked, reverting the site to its pre-hack version is easy and efficient. Update your content management system (CMS) such as WordPress and e-commerce software as necessary and apply all security patches as they are released. Install security software and tools – For added peace of mind and an extra layer of security, install security software. The security of your website should be your number one priority. Without the necessary safeguards on your website, the security of your customers is largely at risk, your own data and information is jeopardized, and your brand and reputation can take a serious hit from which it is difficult, if not impossible, to recover. And, the time and energy investment in developing and implementing your SEO strategy will all be for naught, as your search engine ranking will drop. Don’t become an unfavorable Google statistic. Address weak spots and vulnerabilities and keep the security of your website a top priority. Perfexion, Inc. takes the security of every client’s website seriously. We use SEO to manage and maximize our clients’ web content, website ranking, and search engine results traffic. And, we take steps such as regularly backing up data and updating all software and plugins, including WordPress CMS, as needed – all to protect your website, which includes not only the content, but your clients’ data. Google has established general webmaster quality guidelines that serve to support Google’s efforts to find, index, and rank websites in search results listings. If you (or your web developer) perform an action on your website that Google views as negative or in violation of those guidelines – an illicit, deceptive, or manipulative practice – you will find yourself in trouble with Google sooner or later. In cases where spam is the violation, Google’s own algorithms automatically detect the violation and demote the website in search rankings. Google also relies on humans to review web pages manually. If these reviewers find a violation of the quality guidelines, they take a manual action to address it. Depending on the circumstances, the manual action could be lowering your website’s ranking, removing specific web pages or content, or, in extreme cases, removing your website completely from Google’s search index. Google takes a manual action any time they detect that a website is attempting to trick or manipulate their search engine results and website rankings. While a manual action by Google may appear to be a negative for you or your website, it is not; manual actions are taken to ensure everyone plays by the same rules when it comes to website security, content, SEO, etc. Manipulation of a website occurs in many forms. A few examples follow. First and foremost, when building your website or developing content for it, understand and adhere to Google’s Webmaster Guidelines. As long as you follow the rules, do nothing that intentionally attempts to manipulate your website’s search rankings, and take steps to keep your website secure, you should not be worried about your website receiving a manual action. In fact, web developers should be doing everything they can to avoid appearing to trick Google and instead provide the best possible experience for users and visitors to the website. Of critical importance is to ensure all aspects of the technical SEO for your website are set up and working optimally so that Google can find the website and be certain it is working well and within the guidelines. Should you receive a manual action notification, review it and take steps to address the issue. Once you have fixed the problem, you can submit a reconsideration request to Google’s webmaster team to manually review your site again. The web developers and designers at Perfexion, Inc. take the performance of every client’s website seriously. We manage websites and regularly monitor SEO and search results. If we find something off or unusual, we check all analytics and reports to find the issue and then take immediate steps to correct the problem. When your website is properly ranked and reaching your target audience, you can trust we are following the rules. Contact us to learn how we keep your website safe, ranked appropriately in search engines, and out of cyber jail. We want customers and visitors to your website to find your content valuable and relevant to their needs. Most of all, we want them to feel they can trust you and your website and feel secure doing business with you. Which is Better – Organic Search or Paid Search? Can Organic Search and Paid Search Co-exist? Every business owner has different goals for their website. These goals could include increasing the number of web pages viewed by visitors, decreasing bounce rates, or increasing traffic from new visitors in general. Whatever your goals for your company website, the overarching goal is for your business to first be found online. How does that happen? Someone – a prospective or existing customer – has a need for a product or service and performs an online search. Where that search ends up could make or break your ability to meet your goals, depending on how well your online marketing strategy performs. Online marketing involves the use of search engine optimization (SEO) and search engine marketing (SEM) to draw traffic. While Yahoo and Bing still get some amount of search traffic, Google is the search engine used in the vast majority of online searches. Google’s two main vehicles for returning search results are paid search and organic search. But, is one better than the other? Does organic search provide better results than paid search (or vice versa)? Online marketers everywhere have been trying to find the answer to that question for some time. Let’s next review what each type of search is as well as the main differences between the two. A user who performs a query based on entering specific keywords and key phrases is performing a natural, or organic, search. Proper implementation of search engine optimization is the strategy used in this type of search, as SEO must align with the words and phrases a user enters to perform their search. A business appears in organic search results based solely on the content on their website/webpage and its usefulness and value to the user. Google looks for content that users will find relevant and valuable. According to Search Engine Watch*, more than 90% of web traffic occurs as a result of a business’s website appearing on the first page of Google search results. Using relevant key words and having quality SEO content is the best way for that content to eventually get indexed in search engines and thus ranked higher in Google’s search results. (Yes, it takes time and effort for your web pages to be indexed so that they generate traffic.) Other benefits of proper SEO include increased leads and improved close rates. Online searching and shopping has been on a swift and steady rise in recent years – and the trend shows no signs of slowing down or decreasing. Additionally, Google is, by far, most people’s preferred internet search engine. Savvy web developers and internet marketers understand this and continue to rely on proper implementation and ongoing management of SEO to keep websites as highly ranked on search engine results pages (SERPs) as possible. Search engine marketing, on the other hand, involves the use of certain keywords in paid/sponsored online ads that appear when a user performs a search using those keywords. In contrast to SEO’s organic search quality, SEM is a paid search function in which a business actually pays for visits to their website rather than earn them through an organic search. With SEM, a business bids an amount of money on specific keywords to ensure their ad appears if it matches a user’s search query. Sponsored search results are identified as ads and appear at either the top of the search engine results page (above the list of organic search results) or along the right side of the page. Business owners and digital marketers have found that paid search strategies such as pay-per-click pay off for them – big time. Because of the prevalence of paid ads, users have come to view these listings as normal search results, in spite of them being labeled as ads. And, a business no longer needs to wait months to be indexed and appear on a SERP, as they can pay for the opportunity for their ad to appear in search results immediately and be seen by targeted users. A well run paid search strategy can yield a hefty return on the paid ad investment. Together, SEO and SEM as digital marketing strategies produce results; they can increase and improve your online presence and ensure targeted users receive information that is the most relevant and valuable to them. Improved conversions, increased web traffic, more qualified leads, and ultimately, business growth and profits are all realistic with SEO and SEM campaigns that are designed to work for you. When you understand the timelines for both strategies – SEO can take months to yield results and SEM can provide virtually immediate results – you are well prepared to implement the strategy (or strategies) that best meets your digital marketing needs and overall business objectives. If you want to learn more about how to combine SEO and SEM to boost your website’s ranking on Google, contact Perfexion, Inc., Philadelphia’s web design and development company. The professionals at PERFEXION are digital marketing experts. They collaborate with business owners to design and deliver SEO and SEM strategies that are sure to improve your bottom line. Author Rosanna RiveraPosted on April 5, 2018 August 27, 2018 Categories Online Marketing, Paid Search - PPC, SEM, SEOTags SEM, SEO, SEO StrategyLeave a comment on Which is Better – Organic Search or Paid Search? Business owners everywhere understand the importance of keywords and Search Engine Optimization (SEO) as they relate to how well their website ranks on a search engine results page (SERP). Also important is understanding the relationship between click-through rates (CTR) and a website’s SERP ranking. When comparing CTR between sites with SERP rankings in the first, second, and third positions with CTR of sites that rank lower in search results, the difference is significant. In other words, the higher the ranking, the higher the click-through rate. The data is indicative of when, where, and how a business might change or enhance their SEO which, in turn, enhances their ranking on search engine results pages and which can lead to improved click-through rates. How a user searches for a product or service is one factor that comes into play in the click-through results. If a user already knows the product they want, they type in the company name or product brand, for example, “Kellogg’s®” or “Froot Loops®.” This type of search is called a branded or navigational search. Their intent all along is to get to one specific website. The desired website appears at, or close to, the top of the search engine results page. Because the user has been presented with the exact information they searched for, the likelihood of the user clicking through to the website is high. In this scenario, it is easy to understand why a website or webpage would have a high CTR. CTR statistics also differ depending on the length of the keyword used to perform the search – that is, when a user searches by using a one-to-two-word generic term versus a long-tail search term that contains four or more words. (Long-tail search terms typically narrow the search results field.) If our same user as above performs a search using the term “fruity cereal,” the results are naturally more general, and quite possibly not what the user is looking for. The user next searches for “fruity cereal with marshmallows,” which narrows down the search results considerably. There are fewer fruity cereals with marshmallows than there are fruity cereals in general. Because the results are narrower – more exacting – when a long-tail search term is used, there is less competition among websites for the top positions in the search results and probably fewer ads that compete for the user’s business. The user is apt to find what they are looking for more quickly, and thus more likely to click on the search results presented. The bottom line for website owners who track SEO performance is understanding that click-through rates are better when a search is performed using long-tail keywords instead of a simple generic search. Users often perform a search with a specific intent in mind and when there will be some form of interaction. For example, they might want to buy a product, compare hotel prices, or find directions to a particular location. In these cases, the user’s intent is commercial, informational, or based on location, respectively. A fourth intent – specific intent – combines all three intents in the keywords used. Competition for the top three search results positions is fierce, so intent-type keywords, especially those for commercial and location types, usually present more paid ads and other SERPs results features such as a map to show location. CTRs for website may be lower here, depending on the intent type for which the search is performed. 1st, 2nd, and 3rd Place Matter! While the data varies among digital marketing and web experts, they all agree that the top three positions on a search engine results page, in particular Google’s, garner the highest click-through rates, with the first position racking up the most click-throughs. For example, one study indicates click-through rates for results based on a natural (organic) search range from 36% for first position, to 13% for second position, to 10% for third. The data also indicate that more than half of users are highly likely to click on the first three results presented when the searched based on a branded term. Of further note, only a very small percentage of users who performed a natural search clicked on paid ads that appeared (versus the natural results). SEO and keywords just one. An online marketing professional can show you all the ways to improve your presence in search results and start earning your own portion of the click-through business. If you want to learn more about how to boost your website’s ranking on Google as well as improve your click-through rates, contact Philadelphia web design and development company Perfexion, Inc. The professionals at PERFEXION are digital marketing experts. They provide website audit and consultation services that give clients clear information and direction on the steps they can take to enhance their online presence. If you are the owner of a website, you would do well to understand the meaning of the term domain authority and how domain authority applies to your website. Even nontechnical types should understand this important concept, given the impact it can have on the bottom line of a business. Domain authority, also known as website authority, is a ranking, or score, given to a website that indicates how well the site ranks on search engine results pages (SERPs). This score quantifies just how relevant and authoritative a website is. Domain authority is ranked on a scale of 1 to 100, with 100 the highest score possible and 1 the lowest. Experts commonly agree that a domain authority score of 80 or better is a very good score indeed one only the top, most trusted websites receive. Domain authority takes into consideration the strength and quality of your website’s SEO as well as how likely your site will rank in search results as a function of your SEO. The stronger your SEO, the higher your domain authority, the higher your ranking on SERPs. The SEO experts at Moz* developed the concept of domain authority and its corresponding scores. Do not view domain authority as the means to determining how well your website is performing based on your own SEO; instead, use domain authority as an indicator of how well your website stacks up against the competition. Your domain authority score is not a static number; as you update and change the content on your website, blog, social media, etc., your domain authority score will also change. Remember, SEO factors into the score, and new content implies a variation in SEO. How Is My Website’s Domain Authority Determined? Various online tools are available that let you determine the domain authority score for your own website. Additionally, you can check the average score for your industry overall – information that is helpful if you want to know if your site is on par with the competition or if it is lagging far behind. Do not underestimate the value of your domain authority. Some consider it to be the most accurate measurement available for determining how a website ranks in search engine results which is the ultimate determinant of how much organic web traffic you receive. If you want to learn more about domain authority or what you need to do to improve your domain authority ranking, Perfexion, Inc. can help. The professionals at PERFEXION understand domain authority and SEO and provide a full range of website audit and consultation services for their clients. As a Philadelphia-based web design and development company, PERFEXION stays abreast of all the latest changes in the industry and wants to keep their clients up to speed as well.